Kate Hudson pulled off one of the best jewelry looks on last evening's SAG red carpet by turning her Cartier diamond sautoir spotlight necklace around so that it drapeed along the open back of her Emilio Pucci gown. Kate was one of many celebrities who chose white metal/white diamond jewelry for the event. Tina Fey's earrings were from Neil Lane's new Renaissance collection, and fashioned from a mix of moonstone, brown diamonds, yellow diamonds and white diamonds, all set in platinum. Patricia Arquette chose colorful jewelry, too -- her huge yellow gold chandelier earrings were set with emeralds. Large pendant-drop earrings made a splash on the ears of Julia Louis-Dreyfus, Julie Bowen, Holly Hunter and many other celebrities. Joan Allen gets the nod for the most unusual jewelry on the red carpet, with a striking Native American-like waterfall necklace. L’Oréal Paris and Carelle have once again collaborated to create gorgeous compacts to celebrate and honor Hollywood’s leading ladies. This year, L’Oréal Paris received a prestigious star on the Friends of Hollywood Walk of Fame. To celebrate this achievement, each of the three different compacts showcases shooting stars encrusted with diamonds. The three compacts are made in sterling silver and plated in a different color 18kt gold, which enhances the beauty of the stones and embodies the spirit of the award show for which it is exclusively made. To celebrate their “Best Actress in a Feature Film” nominations, L’Oreal Paris and Carelle are thrilled to congratulate Sandra Bullock, Helen Mirren, Carey Mulligan, Gabourey Sidibe and Meryl Streep with these exclusive compact mirrors. The cool Blue Topaz and 18kt White Gold plated silver on this compact evoke the sincerity and celebration inherent to this award show when fellow actors come together to celebrate each other’s achievements. Blue topaz encourages artists to connect to inspiration and stimulate it, allowing natural creativity to thrive. 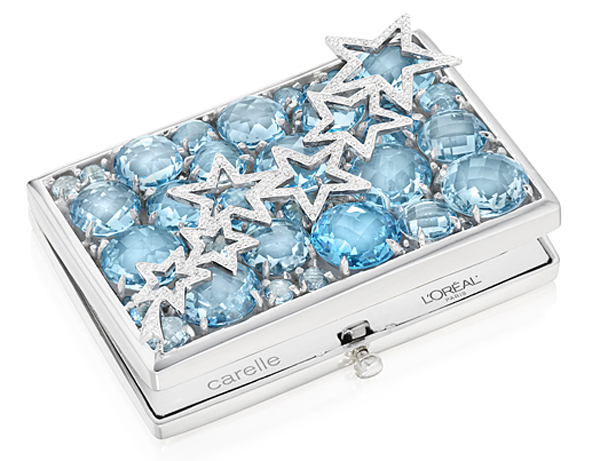 The pavé diamond shooting stars add gorgeous sparkle to this dazzling compact. Hilary Swank's intricate diamond necklace ushered in a new century at the Academy Awards ceremonies. The next year, most celebrities arrived wearing the standard fare of large diamonds and platinum, but two, Juliette Binoche and Ashley Judd, pulled off a successful flapper look. The 9-11 terror attacks were just a few months in the past when the 2002 Oscars were presented, and most stars wore subdued jewelry as a way of showing respect for the victims. Jada Pinkett Smith's jewelry is an excellent example of the understated elegance we saw that year. Large earrings in every style imaginable were popular in 2003 and 2004, and by 2005 showy jewelry of all sorts had returned. In 2007, stars arrived at the Oscars with (taller) diamond-stacked wrists, a trend that continues today. As the end of the decade neared, Oscars jewelry included styles created from black and colorful diamonds, along with designs fashioned from many other colored gemstones.